Live edge tables are simply a single slice of or two consecutively cut slabs of timber made in to a unique table, without a doubt the greatest artist of these was the late George Nakashima, he produced some stunning live edge tables and worked with these stunning slabs of timber in a very sympathetic way. We work with the slabs in a very similar way, Mother Nature has worked her magic on the timber over many hundreds of years and we just help finish it. The idea behind live edge is, in a word, simple. Live edge tables bring nature into your home in a simple way. Nevertheless, these items are finished to withstand our busy life style. I always try to keep the table top simple, due to live edge slabs versatility these can be put on an stand of your choice. Live edge tables have possibly been around for thousands of years in very simple forms. 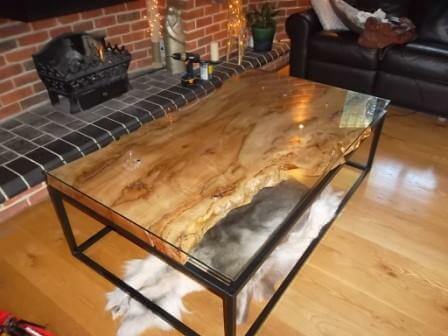 As timber many years ago was all cut by hand the natural slab table would have been a very important item in the home. I find it amazing to think that something with such an old history has now become such a very popular item of furniture. These live edge slabs are generally cut length ways along the tree trunk once the tree has been felled. The tree trunks are sliced in various thicknesses some up to 100mm then stored for several years before being kiln dried ready for use. 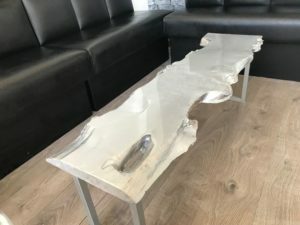 As the name implies we try to keep the natural shape of the slabs so once finished and polished still give the appearance of a very natural organic piece of furniture, the possibilities of these table is endless. 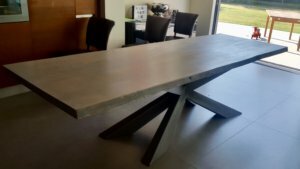 It would be virtually impossible to make every engineered wooden table different, with our live edge tables every single one is unique, and every one tells its own unique story. 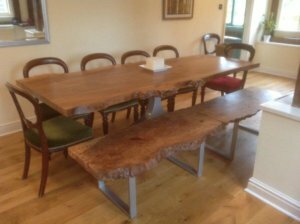 There is a huge variety of timber in the UK these tables can be made from timbers many hundreds of years old from very straight and regular trees ie, beech, sweet chestnut, elm and oak, to really wild old English yew trees. All with their own fantastic mystical history to old knarly oak, that have seen history unfold under their protective canopies, and many of our other amazing hard woods. 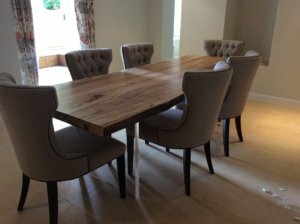 If you are looking for a real talking point and a unique addition to your home then a live edge table is for you, something to be admired and treasured for years to come, then look no further than Unique Wild Wood Furniture for one of nature’s natural treasures.